The incidence of hunger continues to increase in Africa after several years of decrease, threatening the various efforts to eradicate hunger to meet the Malabo Goals 2025 and the 2030 Agenda for Sustainable Development, specifically the Sustainable Development Goal 2. This was highlighted in the report Africa Regional Overview of Food Security and Nutrition released by the Food and Agriculture Organization of the United Nations and the United Nations Economic Commission for Africa. The report states that 237 million people in sub-Saharan Africa are suffering from chronic malnutrition, overturning the improvements accomplished in the previous years. "The worsening trend in Africa is due to difficult global economic and worsening environmental conditions and, in many countries, conflict and climate variability and extremes, sometimes combined. Economic growth slowed in 2016 due to weak commodity prices, in particular for oil and minerals. Food insecurity has worsened in countries affected by conflict, often exacerbated by drought or floods. For example, in Southern and Eastern Africa, many countries suffered from drought," FAO Assistant Director-General and Regional Representative for Africa, Abebe Haile-Gabriel, and ECA Executive Secretary, Vera Songwe, said in their joint foreword of the report. Secretary Luis Miguel Etchevehere of the Government of Agribusiness of the Nation in Argentina announced last February 6, 2019 that they have authorized a new biotech cotton event. The announcement was made during the meeting of the Table of Competitiveness of the Cotton Chain. The new GM cotton event, which is already approved in Brazil, is tolerant to HPPD inhibiting herbicides (isoxaflutole and mesotrione), and glyphosate herbicide. It will allow farmers to have better control of herbicide resistant weeds because it allows them to alternate between herbicides with different mode of action. BASF will commercialize the new trait. Secretary Etchevehere also emphasized the number of approvals that the current Argentine government has granted in the last 14 months. 12 events, which comprises 35% of all Argentina's biotech crop approvals, were made by the current administration. He said that this is the government's response to the delay on the need to integrate genetics and biotechnology into crops. See Agroindustria's press release for more details. Biologist Steve Jacobsen from the University of California, Los Angeles (UCLA) is conducting a research that has a potential to have a significant impact on the improvement of crops. Jacobsen specializes in plant epigenetics, and is a cofounder of the company Inari, which has licensed plant breeding patents he developed at UCLA. Jacobsen's work descibes the inner workings of epigenetic pathways in plants, and the tools that allow for precise changes in gene expression through modulation of epigenetics. One of his research focused on various proteins in the plant Arabidopsis, and how they can be used to target DNA methylation. His research team explains in detail exactly how specific biological pathways work. Jacobsen's agreement with Inari provides the company new ways to improve plant performance by tapping natural genetic diversity, and provides access to technology that influences a plant's genes without altering its genetic code. For more details, read the news article in the UCLA Newsroom. 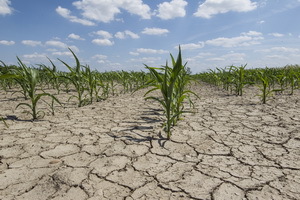 A new report published by the U.S. Department of Agriculture Economic Research Service (USDA ERS) and authored by Jonathan McFadden, David Smith, Seth Wechsler, and Steven Wallander discusses the adoption and use of drought tolerant (DT) corn in the United States. Droughts have been among the significant causes of yield reductions and losses for centuries. Conventionally bred drought tolerant corn was commercially introduced in the United States in 2011, while genetically engineered (GE) corn in 2013. Majority of DT corn planted in 2016 had one or more GE traits such as herbicide tolerance and/or insect resistance. The report concludes that over one-fifth of U.S. corn acreage was planted with DT corn in 2016. DT corn accounted for only 2 percent of U.S. planted corn acreage in 2012, but this grew to 22 percent in 2016. The researchers also found that the pace of adoption is similar to the adoption of herbicide-tolerant corn in the early 2000s. At least 80 percent of DT corn acres were planted in 2016 with seed conventionally bred for drought tolerance, while 20 percent was planted with GE seeds. At the national level, 3 percent of all U.S. corn acres in 2016 were planted with seed that had been genetically engineered for drought tolerance. For more details, download and read the report from the ERS website. The battle to save the multi-billion dollar citrus industry in the U.S. from the incurable disease called Huanglongbing or HLB, has prompted scientists to explore the possibility of breeding genetically modified (GM) trees that are resistant to the disease. However, given the controversy over the safety of GM food, scientists need to know whether producers will adopt this technology and whether shoppers will buy and consume GM citrus fruit. A recent study has some encouraging answers. A team of scientists from several universities surveyed a representative sample of U.S. consumers to better understand the consumers' attitudes about GM food and agriculture. About half of the 1,050 people surveyed had positive attitudes toward GM science. Nearly 37 percent of the consumers surveyed felt neutral about GM science and 14 percent had negative perceptions of it. The survey also assessed the potential impact of the "spiral of silence" theory, a hypothesis on public opinion formation where people who are highly vocal about their opinions in public encourage others with similar views to speak out while effectively silencing those who hold opposite views. However, the researchers found that those who rejected GM science were more vocal about their opinion while others held opposite views. People who were positive about GM technology were less likely to speak out when they believed others supported it too. For more details, read the research news from the Illinois News Bureau. Despite the national policy on safe and responsible use of modern biotechnology, several local government units in the Philippines have passed resolutions and ordinances banning genetically modified (GM) crops in their respective areas. Across the globe, particularly in Europe, there are still many skeptics who refuse to recognize the potential benefits of GMO technology to raise farmers' income and yields, improve adaptation to climate change, and increase the crop's nutrient content. 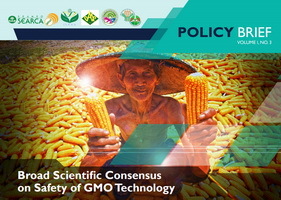 Dr. Emil Q. Javier, a member of the National Academy of Science and Technology (NAST) and Chair of the Coalition for Agricultural Modernization in the Philippines, Inc. (CAMP), puts the spotlight on the scientific consensus in favor of GM technology based on published statements of the world's leading academies of science and responsible agencies. This is published as the third policy brief produced by SEARCA Biotechnology Information Center (SEARCA BIC). These statements essentially validate the potential of GMO technology to increase and improve the efficiency of production of main food staples, reduce the environmental impact of agriculture, and provide access to food for small-scale farmers. The global scientific community concurred that GMO technology are no more risky than conventional plant breeding technologies. They also attested that these technologies are safe and that no effects on human health have been shown as a result of consumption of GM foods. The 2018 Policy Brief series is produced and disseminated in partnership with the International Service for the Acquisition of Agri-biotech Applications (ISAAA), Coalition for Agriculture Modernization in the Philippines (CAMP), Department of Agriculture-Biotechnology Program Office (DA-BPO), Program for Biosafety Systems (PBS), and DA-Bureau of Agricultural Research (DA-BAR). For more details, read the full policy brief. Research conducted by scientists from John Innes Centre (JIC), in collaboration with colleagues in Hungary and France, shows that vernalization is influenced by warm conditions as well as cold, and a much wider temperature range than previously thought. Vernalization is the process by which plants require prolonged exposure to cold temperature before they transition from the vegetative state to flower. The study began as an exploration into how variance in ambient temperatures might influence flowering regulation in winter wheat. But it unexpectedly uncovered an "extreme vernalization response". Before the study, it was thought that vernalization only happened up to a maximum of about 12°C. The researchers found that the true temperature was much higher. The researchers exposed a panel of 98 wheat cultivars and landraces and to temperatures ranging from 13 to 25°C in controlled environments. Normally, when vernalization is complete, plant growth is accelerated under warm temperatures. However, one cultivar, named Charger, did not follow this standard response. Gene expression analysis showed that the wheat floral activator gene (VRN-A1) was responsible for this trait. Further experiments showed that expression of genes that delay flowering is reactivated during high temperatures of up to 24 °C, showing that vernalization is not only a consequence of how long the plant experiences continuous cold. Wageningen Economic Research and IFLS Frankfurt have conducted a study for the European Parliament which provides a comparative analysis of global agricultural policies to draw lessons for the future of the Common Agricultural Policy (CAP). An in-depth analysis of selected instruments in five countries (Australia, Canada, Japan, Switzerland, and USA) were conducted and recommendations were drawn on how current instruments and the policy mix can be improved to better address challenges for agriculture and rural development in the European Union (EU). Policy proposals and recommendations included instruments for risk management, rural development, support in regions with natural constraints, and innovation and knowledge. These recommendations state that the EU could still learn from other countries, particularly to achieve farm income resilience through risk management tools and to achieve climate and other environmental objectives. For more details, download the full report at Wageningen University and Research website. Scientists from China characterized the gene OsFTL10 in rice and they found that its overexpression can lead to earlier flowering of the rice plant by up to two weeks than normal. In their paper published by the Journal of Life and Environmental Sciences, the scientists investigated the role of the OsFTL10 gene and its function on flowering and abiotic stress. OsFTL genes are Flowering Locus T-Like genes in rice. These determine the plant's flowering time control, which in turn is important in plant reproduction. In the case of OsFTL10, the scientists noted that the overexpression of the gene not only induced early flowering, but it also improved the drought tolerance of transgenic plants by activating the rice's drought response mechanism when it is continuously expressed in all plant parts. Further studies of the OsFTL10 target genes were recommended by the scientists to identify the direct link between the flowering and drought stress in rice. Read the full open-access paper in PeerJ. Folate is a form of B-vitamin necessary for the production of red and white blood cells in the bone marrow, convert carbohydrates into energy, and other functions. Low intake of folate in the body may lead to serious disorders. To improve human folate status, it has been recommended to enhance the folate content of food crops, which can be achieved through metabolic engineering. To do this, Chinese Academy of Agricultural Sciences scientists cloned two GmGCHI (GTP cyclohydrolase I) genes (Gm8gGCHI and Gm3gGCHI) and one GmADCS (aminodeoxychorismate synthase) gene from soybean, which are responsible for synthesizing the folate precursors pterin and p-aminobenzoate, respectively. They tested the functions of the genes first in transgenic Arabidopsis plants and found that Gm8gGCHI increased pterin and folate production more than Gm3gGCHI did. Then they co-expressed Gm8gGCHI and GmADCS in maize and wheat to boost their folate content. Results showed a significant increase in the folate levels in transgenic maize and wheat grains, implying that the two-gene coexpression strategy could be used to enhance the folate levels in the two important stable food crops. Read the research article in the Journal of Experimental Botany. Scientists from University of Lleida-Agrotecnio Center and partners aimed to alter the starch biosynthetic machinery of rice using CRISPR-Cas9 to introduce mutations affecting the Waxy (Wx) locus encoding granule-bound starch synthase I (GBSSI) in rice endosperm. Mutation of genes in the starch biosynthetic pathway has a significant impact on starch quality and quantity. CRISPR-Cas9 mutations lead to the reduction, but not elimination of the GBSS activity in the seeds. It was reported that the GBSS activity in the mutants was 61–71% of wild-type levels, similarly to two irradiation mutants, but the amylose content was reduced to 8–12% in heterozygous seeds and to as low as 5% in homozygous seeds. Abnormal cellular organization in the aleurone layer and amorphous starch grain structures were also observed. The expression of other genes involved in starch production was modulated in seeds and leaves, which resulted in the changes in AGPase and sucrose synthase activity which explained the corresponding starch and soluble sugar concentrations. Plant scientists are now using genome editing tools to explore on gene function and develop crops for improvement of traits. One of the technical challenges in using such tools is to efficiently induce precise and predictable targeted point mutations for crop breeding. Thus, new additional tools have been developed such as cytidine base editors (CBEs), which are CRISPR-Cas9 derived tools used to direct cytidine to thymine base conversion. In dicots, the most stable genomic integration of CRISPR-Cas9 is through Agrobacterium-mediated transformation. However, elimination of the foreign DNA may be hard to accomplish, particularly in vegetatively propagated plants. Florian Veillet from Institut National de la Recherche Agronomique in France, together with other researchers targeted the acetolactate synthase (ALS) gene in tomato and potato by a CBE using Agrobacterium-mediated transformation. 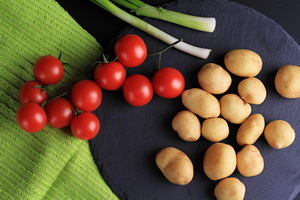 They successfully edited the targeted cytidine bases, which led to chlorsulfuron-resistant plants with precise base edition efficiency of up to 71% in tomato. They also produced 12.9% and 10% edited (transgene-free) tomato and potato plants, respectively. This approach decreases the unwanted effects that may be caused by random integration of transgenes into the host genome. The new approach used in the study is expected to introduce new perspectives for genome engineering by co-edition of the ALS with other genes, leading to transgene-free plants with new traits. Read more findings in the International Journal of Molecular Sciences. A new report from CoBank, accompanied by a video by CoBank Senior Economist Crystal Carpenter discusses gene editing, and its benefits and challenges. Titled Gene Editing: A Potential Game Changer for Crop Agriculture, the report describes gene editing as "game changing," "revolutionary," and "evolutionary." The report points out that the potential benefits of gene editing technology are vast, and scientists are continually improving the technology and uncovering new applications to resolve some of agriculture's greatest challenges. However, it also cites consumer acceptance, regulation, and technology and intellectual property as the technology's major challenges. Lastly, the author states that two factors that are critical to the widespread success of gene editing are: developing the technology in a responsible way, accurate and transparent communication about the technology, and the benefits that matter most to consumers. For more details, read the report or watch the video from CoBank. With ISAAA's continuous efforts in shaping sound policy and regulations, our aim is to attain responsible deployment and adoption of biotech crops. ISAAA provides various forms of support to enable transfer of appropriate biotechnology applications, at the same time stimulate science-based discussions through effective science communication. 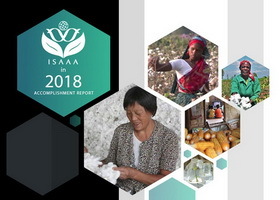 ISAAA in 2018: Accomplishment Report highlights our efforts to bring the benefits of biotechnology to those who need it most and uplift more lives, especially in the developing world. Get a copy from the ISAAA website.